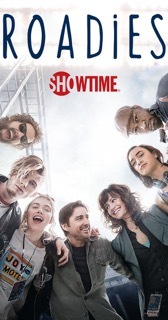 I have been enjoying Cameron Crowe’s new Showtime series, ROADIES. This has been a world that has fascinated me. I even tried to interview members of Springsteen’s crew back in the ’80’s, but couldn’t make it happen. While I have enjoyed the show, it is also enormously frustrating. It is set against the backdrop of a tour for the fictional and apparently the one-time popular Staton-House Band. We occasionally meet House, lead singer and songwriter Christopher House. And the bass player Rick Bayless appears infrequently. But five episodes in, I have no idea who Tom Staton is other than by reputation. The main characters in the show are the members of the touring crew. The tour manager, Bill (Luke Wilson), the production manager Shelli (Carla Gugino), one of the riggers Kelly Ann (Imogen Poots), the bass tech Milo (Peter Cambor), the audio tech Donna (Keisha Castle-Hughes), another crew member and Kelly Ann’s brother Wes (Machine Gun Kelly) and the record company’s toady Reg (Rafe Spall). It’s about how they deal with each other, the band, fans, stalkers and a host of dilemmas. Because it is from Cameron Crowe it is full of heart and a love of music. Oh, the cameos! So far there has been Lindsey Buckingham, Jim James, John Mellencamp, The Head and the Heart, Lucius just to name a few. All have performed. It’s really quite cool. And it feels real and unreal at the same time. It feels like it could be what really happens on the road. But it also feels kind of fake. While the writing and performances are wonderful (occasional appearances by Luis Guzman, Ron White, Finesse Mitchell and Brian Benben are treats), there is a huge hole in this enterprise. The band never plays. We never hear one note of music from the Staton House Band. There has been an arc about this one song “Janine”. We even meet the Janine it is based on. But we never hear the song. On some series such as THE WEST WING, the writer can talk about plot points or characters and even though we never see them, it works because it is not what the show is about. This show is secondarily about music and performance. They need to figure out how to do it or the ROADIES will always feel a bit less than it could be.